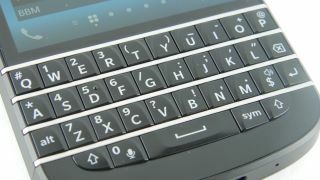 Can renewed focus on physical keyboards save BlackBerry? Or is it out of touch? Touchscreen smartphones might be all the rage but it seems that the humble QWERTY keyboard still has a place, in Canada at least. Bloomberg quotes new BlackBerry CEO John Chen at CES 2014 saying "I personally love the keyboards", adding that that future BB devices will "predominantly" use physical keyboards. Perhaps in a move to underline just how important keyboards are to BlackBerry's future, the Canadian firm is suing the creator of iPhone QWERTY snap-on Typo, an accessory that looks suspiciously like the BlackBerry Q10 keyboard. This could help BlackBerry re-establish themselves as a major smartphone player, following some less than impressive forays into the touchscreen market with the BlackBerry Storm and the more recent BlackBerry Z10 and Z30. It would also help gain back the business sectors that made the BlackBerry brand the mobile giant in the first place, the same sectors that are prolific with emails and rely upon physical buttons for easy typing. It makes sense then, that BlackBerry is set to focus on these markets over the next 18 months. With all this focus on physical keyboards, you'd be wrong in thinking that this means the Canadian firm is set to abandon the consumer market completely. "Since I showed up there has been a lot of speculation that we're retreating from the phone business or the consumer business. This could not be further from the truth" said Chen. 2014 may herald a BlackBerry resurgence, and maybe one day we'll see BlackBerry return to being the device of choice amongst teens and young adults. Don't expect that to be anytime soon though, with Chen adding "if there's a dollar I need to spend between the consumer space and the enterprise space I'll spend it on the enterprise space for now".